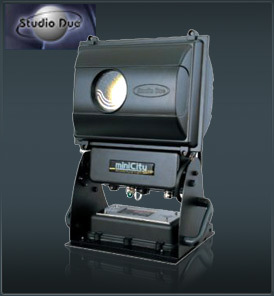 The new product of the "architectural" family of the Studio Due fixtures is the new Studio due MiniCity 250 has an intermediate position between the MiniCity150 and the great series of the CityBeam and of the CityColor. The fixture uses the tested CYM colorchanger system, patented, developed by our labs and a new optic system with an opening angle, which can be varied, driven by two stepper motors. With a new mechanical structure, a new internal cooling system and with a new circuit with displays to program the fixture, it was possible to guarantee an IP rate of 66; in this way it is possible to use the fixture in all environments both indoors and outdoors. Twentyeight programs are already stored in the fixture and it can therefore be used also without remote controllers and in synchro mode with Master/ Slave setting. It is also possible to personalise the use of the fixture through the DMX connection, by using a standard remote controller. Further characteristics of the fixture makes it possible to dimmer and to switch-off the lamp by a remote controller; in this way the fixture is suitable for live performances (for example theatre).